Start your day right with a breakfast of word-building. 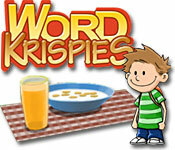 Challenge your brain to make words out of cereal letters before they get soggy and sink out of sight. The longer the word, the higher the score. Use vitamin power-ups and bonus rounds to help you even more. Eat your Word Krispies! Breakfast has never been this fun! Word Krispies is rated 4.5 out of 5 by 6. Rated 5 out of 5 by mrm2006 from Great Family Game! I usually dislike word games but I absolutely LOVED this game. The storyline is fun and will keep the kids entertained. There is a female adult lead character and a small child character who are going from place to place looking for a lost diamond in a box of cereal. The graphics are amazing. Realistic looking bowl of cereal, "word krispies" large enough for even the youngest (or oldest - lol) eyes to see well. I can't comment on the music as I had to turn it down (puppy sleeping on my lap - smile). The object of the game is to make words with the letters. Using them before they get too soggy and disappear. You make words of 3 or more letters and fill the "tower" by making either a lot of words or large words. There are 2 game modes - classic, which is untimed or arcade which has a timer. I played "classic" and found it perfect to play with youngters. No time limits makes it fun and not stressful for the little ones. This is a PERFECT game for the little ones to learn to make words and the older ones to make larger words. I can't say enough of how much I enjoyed it. Definitely give this demo a try. It has MY vote. ENJOY! Rated 5 out of 5 by Batstrings from Original! I had a lot of fun with this game! I thought it had a unique and playful twist on the usual word games and surprisingly challenging. It was definitely a nice change! And who doesn't miss the toys in the cereal? Rated 5 out of 5 by gailwarning54 from LOVED THIS GAME!! I thought this game was very entertaining. 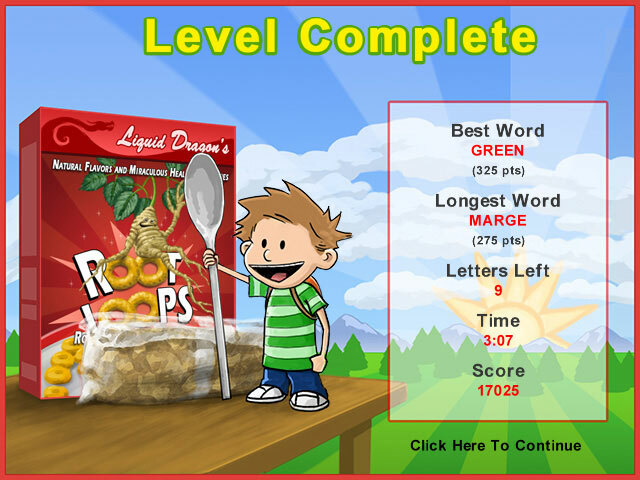 It was fun trying to find bigger words than other word games offer. The bonus games were fast but challenging. Rated 2 out of 5 by kit1717 from untimed mode is timed This Word Krispies game says it has an untimed mode, but it is most definitely timed! If you are not quick enough to select the letters in the UNTIMED mode, the letters sink. Since I am disabled, so I cannot select the letters fast enough. This makes the game not very much fun for me. So if you are not quick, this game is not for you.